The only person to visit Wikileaks suspect Pte Bradley Manning in custody other than his lawyer says his health has declined in the past four months. Pte Manning, a US soldier, is being held in solitary confinement in a high-security military prison at Quantico marine base, Virginia. US journalist David House, who has been visiting him since September, told the BBC World Service he looked "frazzled". 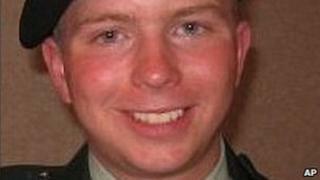 The Pentagon has denied it is mistreating Pte Manning. A Marine Corps spokesman said the military was keeping him "safe, secure and ready for trial". Pte Manning faces up to 50 years in jail if convicted of leaking secrets. The 23-year-old was arrested earlier this year and charged with stealing secret information. One accusation is that he handed Wikileaks video of an Apache helicopter killing 12 civilians in Baghdad in 2007. However, there has been no formal indictment and no date for a trial has been set, according to Mr House. "He is being kept in a kind of punitive fashion before his trial and it is definitely weakening his mental state," the journalist said. Pte Manning is confined to his cell 23 hours a day and is not allowed to exercise or have access to media, Mr House told the BBC. His marine guards must check upon him every five minutes, including at night, and a light is kept on in his cell when he sleeps, according to the journalist. He complained to Mr House last week that the blankets he is given are so heavy and uncomfortable they feel like carpet squares. "He said he would frequently wake up in the morning with carpet burn, a problem exacerbated by the fact that he is required to sleep in his boxers," the journalist said. When Mr House comes to see the prisoner twice a month, their meetings take place in a room with marines standing nearby and their conversations are recorded by the US government. When Mr House first visited Pte Manning in September, he found him mentally "very alert" and, physically, he looked to be "in very good health". "Over the months, I've seen his condition deteriorate. Mentally, he now has trouble keeping up with some topics of conversation. He has bags under his eyes and he appears to be very weak." Asked by the BBC what he made of an assertion by WikiLeaks founder Julian Assange that the Pentagon was pressurising Pte Manning into testifying against him, Mr House said he had not got the impression that the soldier was co-operating with investigators. Nor did Pte Manning seem to mind that the media had focused on the fate of Mr Assange, and not his own, the journalist added. Mr Assange is currently on bail in the UK, facing extradition proceedings to Sweden on sexual assault allegations. US authorities are thought to be considering an extradition request for Mr Assange on espionage charges. The WikiLeaks founder says he believes he may be killed if he is jailed in America.